Brilliant show for young children - and adults! My four year olds laughed the whole way through at fart jokes and enjoyed the audience participation that is similar to that of a traditional pantomime. The cast were excellent and we appreciated the Princess coming out to have her photo taken in the foyer at the end. Highly recommend! A 3-STAR Review from The Edinburgh Guide. This is a 5 STAR review by the Edinburgh Reporter on Friday 1st August 2014. Starting life off as a book it is a good fun read by brilliant writer Robin Mitchell. My children love the book and my 12 year-old daughter was really eager to see the show, so tickets bought we headed to the Freemason’s Hall in George Street to see the stage show . While many actors are competing with each other for ONE role in a stage production, Philip Kingscott of Deans in Livingston will be appearing in THREE shows at this year’s Edinburgh Festival Fringe. Philip will be appearing as Guffy in the children’s show Princess Pumpalot: The Farting Princess at 11.30am, as Callum Patterson in Silence in Court at 4:30pm and also as Callum Patterson in Conflict in Court at 6:30pm The shows and the roles he plays are not only miles apart in content but hours apart in time. This is an excellent article about Philip Kingscott on The Masques Agency website. Philip plays Princess Pumpalot's servant GUFFY in the the 2014 Edinburgh Festival Fringe Production of Princess Pumpalot: The Farting Princess at the New Town Theatre. The cast has been announced for the 2014 Edinburgh Festival Fringe production of Princess Pumpalot: The Farting Princess at the New Town Theatre in George Street. The show takes place daily at 11.30am from 31st July - 24th August (not 12th). We are delighted to reveal the new Princess Pumpalot. It's a little like the new Dr Who, except it's Princess Pumpalot. 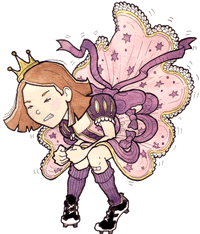 The brand new Princess Pumpalot: The Farting Princess (circa 2014) is Lindsey Lee Wilson. Lindsey Lee trained in acting at the Arts Educational Schools, London. Her first television job on graduating was Eastenders , followed by her theatrical debut on London's West End with the Soho Theatre Company. Delighted to annouce the book is to be translated into Arabic. Geoffrey the Giraffe invites you (and your pet giraffes!) to join the fun at this year's Edinburgh Fringe show. Tickets for our children's show are now on sale at the Edinburgh Festival Fringe Box Office.